FRIDAY night, the Seattle-area band the Posies stopped through the Bootleg Theater, which has gradually become one of my favorite places to see a show in Los Angeles. Out with me was a music writer whose work I’ve admired for 20 years (okay, she’s now my wife), who was an ardent fan of the band back when they and a handful of other indie rockers were reviving power pop in the wake of grunge. (One of the group’s singers, Ken Stringfellow, has played with Big Star’s Alex Chilton as well as R.E.M. — whose bassist, Mike Mills, was at the show last night.) But the days when you’d hear the group at bars and clubs and in the background of socializing — as they seemed to be in the early ’90s — are gone; a lot of music fans surely don’t know they’re still, at least some of the time, very much together. In any case, I’ve been musing on a piece about how riveting power pop can be live: In the last few weeks I’ve seen Sloan and Nada Surf, with Teenage Fanclub and the New Pornographers a bit further back. (The pre-show music playing in the club offered a kind of homage, with songs by Big Star, Cheap Trick and the Knack.) But that will have to wait, because this review is by the great Sara Scribner. Here she is. 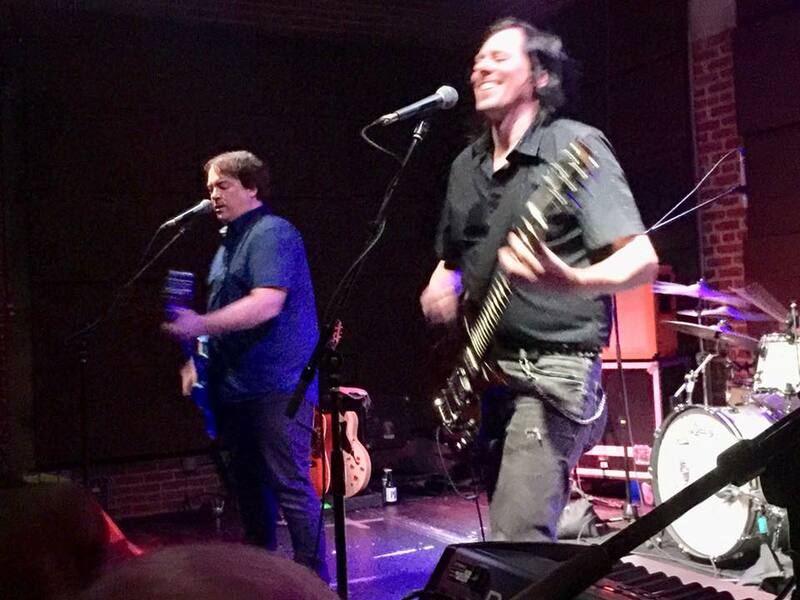 A few songs into the Posies show at the Bootleg Theater, Jon Auer paused and surveyed the crowd, noting that he was slightly chagrined about looking a bit timeworn and threadbare. “I just realized,” he said with a smile, “you’re all older too.” That may have been true, but no one at show marking the band’s 30th anniversary had been feeling it. The band had the room fully lit — spun out on singer and guitarist Ken Stringfellow’s taut power-chords, Auer’s still-dreamy vocals, and the pair’s electric chemistry. I’ve been to a few 80s and 90s reunion shows. Sometimes they’re just depressing, reminding you all of all the time that has passed. This one, like Dinosaur Jr.’s high voltage show in 2006, was a different beast: it served to brush away the dirt on the lens, redefining and focusing what had made the band great, and what keeps it that way today. There are few bands who perfected power pop as the Posies did. Not all of their songs hit, but when they did, the effect is about as close to nirvana as it gets. They didn’t waste any time in reminding the crowd of this, just getting it out of the way by opening with “Dream All Day.” A few songs later came “Golden Blunders,” one of their best-known songs, a shimmering, dreamy wonder full of juicy hope and apocalyptic regret, as good as any song ever inspired by Big Star. Auer’s low-key energy belied his still-serious gifts as a singer — he’s all grown-up now, and there’s not much of the grunge-era mane that he flung around in his Geffen heyday. Stringfellow, however, shook off the years, locking in with Auer at key moments, rocketing across the stage, spitting (as is his wont) when the urge grabbed him. Together, they almost resembled a father-and-son team, but fully in sync and with each others’ firm respect and approval all the way. The team spirit was surely amped up by enlisting all of the original members from their early-‘90s, Frosting on the Beater lineup, including drummer Mike Musburger and bass player Dave Fox. There seemed to be some trepidation about playing Los Angeles — angst also delivered by the group’s killer opener, Terra Lightfoot — and it wasn’t hard to imagine that Los Angeles had a fair mix of good and bad memories for Stringfellow and Auer. That didn’t last for long, as the group churned out a super-tight set full of sugar and adrenaline, lit every now and then with a little rocket fuel. Fans can keep them as their secret, but there has always been a big question mark attached to the band — what happened? Why didn’t they blow up as they should have? How could Geffen have screwed up this gift, a group who wrote songs this good? At this show, all of those questions, all of the hard years, including deaths of band members, fell away. The Posies played their hearts out, and they won ours all over again. Geez, a little harsh on Jon with the comments about his hair, and especially the ‘father-and-son team,’ yowza! Especially when you consider Ken is the older of the two! But dead-on about Geffen screwing up this gift — and what could have, and should have, been with this band. It’s always been a double-edged sword for us fans, who would have liked to see them ‘blow up ‘– but also appreciate that since they didn’t, we don’t have to go see them in big, impersonal venues — but nice small ones like the Bootleg Theater.